He’s done it. On Saturday October 27 at just gone 4pm, Glenn Murray became just the second ever Brighton & Hove Albion player to hit a century of goals. Murray’s 100 means that any questions that people still had about whether he can sit at that top table of Albion strikers alongside Peter Ward and Bobby Zamora have been answered. 100 goals in 231 games across 10-and-a-half years and three divisions is quite the record. Being the football geek that I am, I have a spreadsheet detailing every game I’ve seen Brighton play and every goal I’ve seen scored. That means I can tell you that of Glenn’s 100, I’ve been there for 70 of them. I’ve taken on the challenge and narrowed it down to a top five. These aren’t necessarily Murray’s best goals – thinking about it, he doesn’t score many worldies – but they are the most memorable, the ones that really meant something. So without further ado, here are Scott McCarthy’s Top Five Glenn Murray goals. This was the afternoon that everything changed for Albion on the pitch and it was Murray who kick-started the revolution. 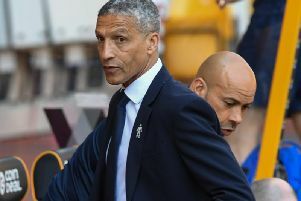 After years of struggle, Gus Poyet was in the dugout for the first time as the Seagulls travelled to Southampton and nothing would be the same again. From day one you could tell he was different to any manager who’d gone before him. Murray scored the first goal of the Poyet era, a cool as you like side foot volley from a Dean Cox cross. It was the start of a brilliant run of form for Murray under Poyet which made it all the stranger that the Uruguayan criminally allowed him to leave on a free in the summer of 2011. The Albion might now be rubbing shoulders with the Manchester United’s and Arsenal’s of this world, but seven short years ago we were enjoying Tuesday night trips to Dagenham & Redbridge. Poyet’s side rocked up in East London having been on a remarkable run in March, winning all seven games. Victory at struggling Dagenham would make it eight from eight, a stunning achievement given that they’d played two games a week through the month. The away end at the Victoria Ground was a tiny seated stand raised above the pitch behind one of the goals, which gave the perfect view of Murray volleying home Craig Noone’s cross for the only goal of the game. 24 points were in the bag from four weeks work and promotion to the Championship was within touching distance. It seems mad to think it now given his universal popularity, but even when Murray was back and banging in the goals that would eventually take us into the Premier League there were still those who didn’t like him due to his spell with Crystal Palace. This was the day that all changed. Brighton had been awful in the last game before Christmas 2016 until Anthony Knockaert scored an undeserved equaliser to make things 1-1 with eight minutes remaining. We were then into the fifth minute of injury time when Murray rose to head home a Knockaert corner before sprinting the entire length of the St Andrew’s pitch to celebrate in front of a mental away end. For reasons that seemed to make sense at the time, I’d gone to the game wearing a £10 Santa Claus outfit and so ferocious were the scenes at the end that I ended up splitting the trousers in two, which made for an interesting train journey back to Sussex. Not that anybody cared – Murray was truly back, and we were starting to believe that promotion was a real possibility. The Albion were enjoying a decent debut season in the Premier League but one thing was missing – they hadn’t beaten any of the big six. The scalp of a top team would be the icing on the cake and it finally happened when Arsenal came to the Amex in March. It was a classic Murray goal that ended up winning the game as he rose to expertly head a Pascal Gross cross past Petr Cech, adding more impetus to the Murray for England bandwagon. Okay, confession time here – I actually missed Glenn’s 100th goal. There is always a risk when you are still guzzling on a Fosters as the second half kicks off and that’s what happened here. Still, the way he is going and the fact he seems to be getting better with age means I’m not actually too disappointed. If Murray can net 20-goals-a-season, he’ll make it to 200 in five-years-time at the age of 40. Let the countdown begin!